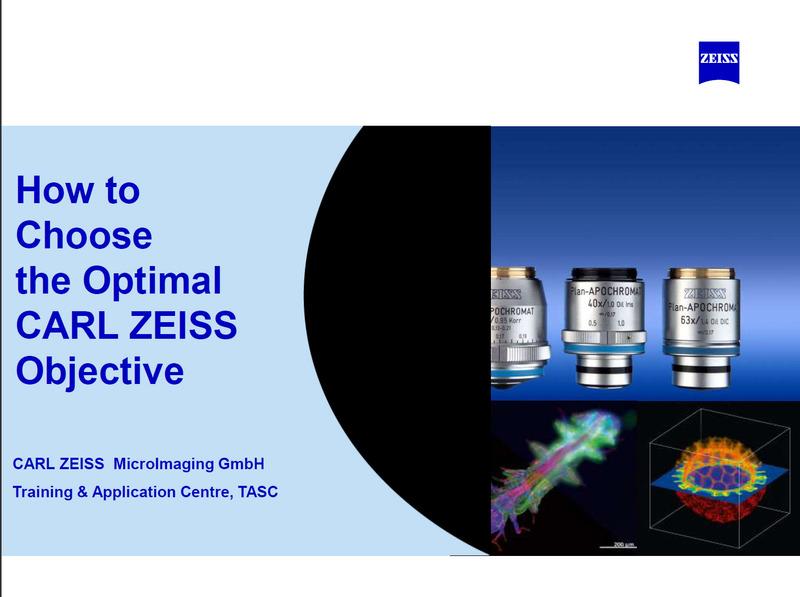 The objective is the microscope – it is a precision piece of equipment, with individual corrective glass elements aligned with each other to tolerances of a few nanometers: a fraction of the wavelength of light. Also, the front element has an anti-reflection coating to optimise contrast in the image. This can sometimes be seen as a faint green or purple sheen on the glass surface if the objective is viewed obliquely. This anti-reflection coating is very thin, for it works by interference (for explanations of how these coatings work, see this Hyperphysics page and Edmund Optics page). For these reasons, objectives must be cleaned – and handled – very carefully. 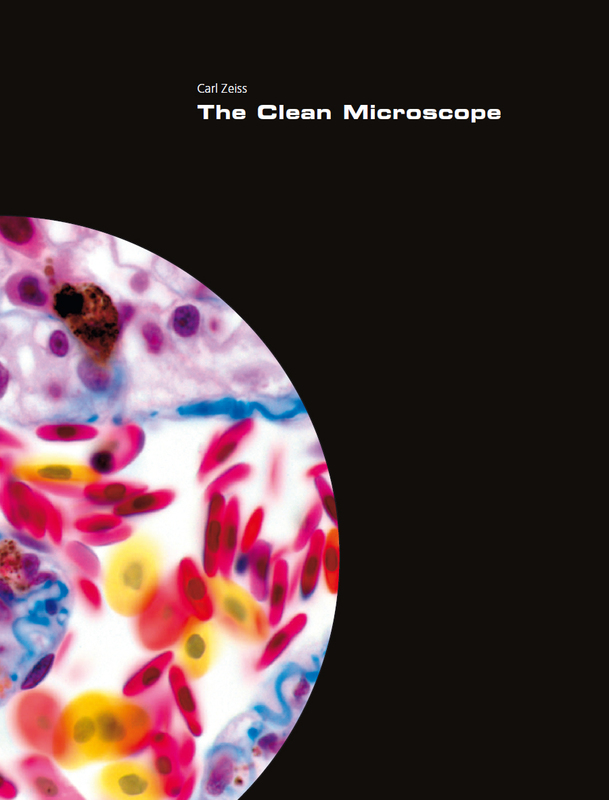 Ideally, do not remove the objectives from the microscope for cleaning – if they slip out of your hands and you drop them – even a few centimetres – they will be ruined. It is best to clean the objectives in situ. It is particularly important to remove all the oil used for immersing the slide to the objective. Oil left on the objective will dry on, being harder to clean off later. Oil left on the objective will also cause blurred images. If the objective is removed from the microscope, keep it screwed into the base of the objective pot, for support. Oil which is left on an inverted objective may well seep into the body of the objective, rendering it useless. The objective then has to be sent back to the manufacturer for disassembly and cleaning. This is a very expensive exercise, in some cases costing several thousands of pounds. 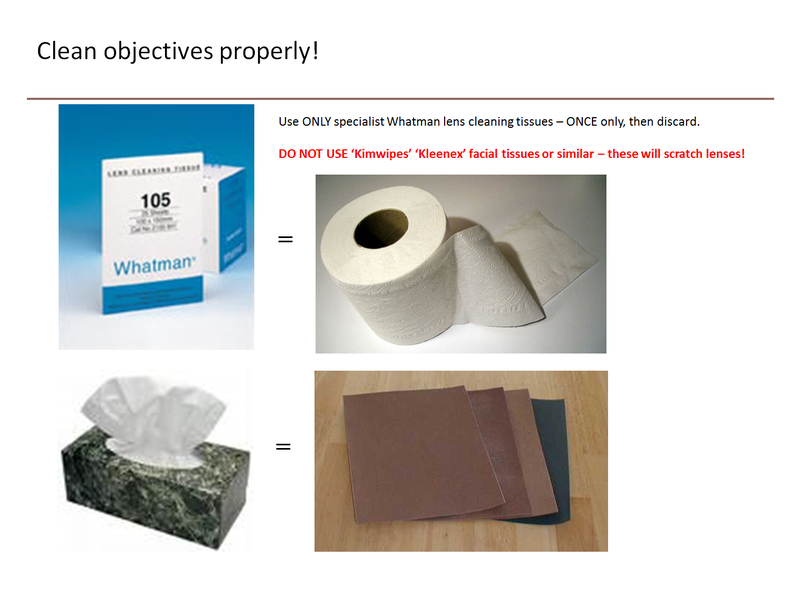 You must only use Whatman lens tissue paper moistened with cleaning fluid (kept in the dropper bottles) for cleaning objectives. (The Clean Microscope recommends 85% v/v n-hexane and 15% v/v propan-2-ol). Sometimes, hair scrunchies, pipe cleaners or custom-made objective covers are used around the base of objectives on inverted microscopes to prevent oil seepage. These must be inspected and changed regularly. Use the ethanol when cleaning water off a water-immersion objective. 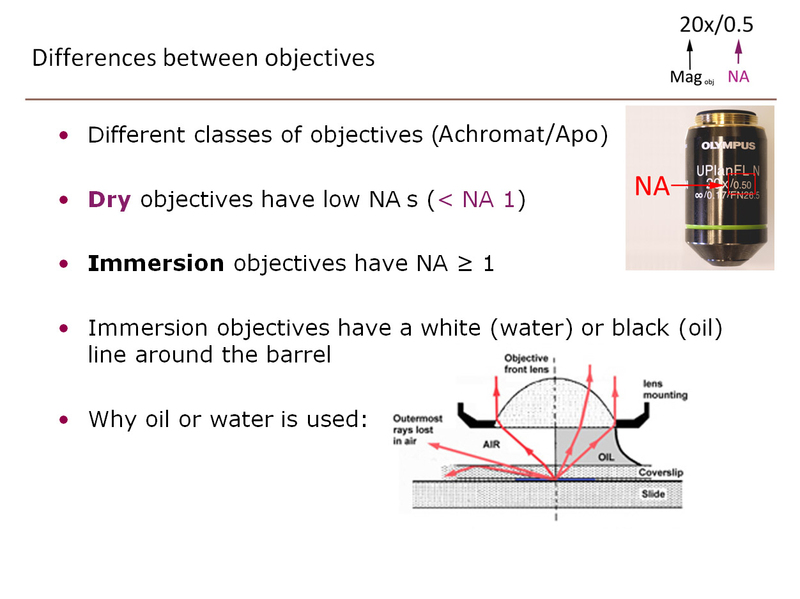 If you use the Immersol W oil with a refractive index of 1,33 with a water-immersion objective, use cleaning fluid to clean the lens, as for the oil-immersion objectives. 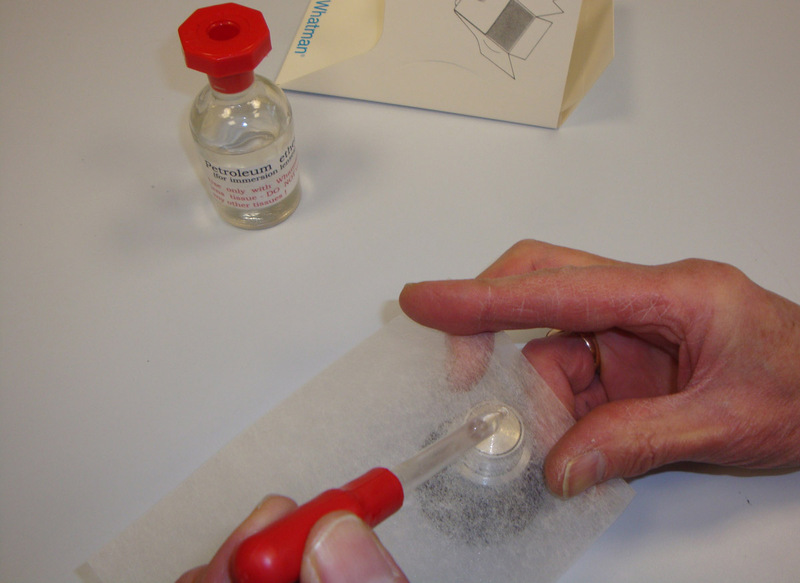 A supply of solvent and lens tissues should be kept by each microscope. Do not use the lens tissue dry, and under no circumstances use Kimwipe tissues or similar paper towelettes. These Kimwipe tissues have coarse paper fibres, and often contain silica particles. They will scratch the delicate anti-reflection coatings on the front lens of the objective, and will ruin it, permanently causing flare and reduced contrast and reduced signal-to-noise ratio in the image. Never be afraid to ask the LMF Manager for tuition on how to properly clean an objective. Also ask for help if you feel that you have not managed to clean off all the oil from an objective located in situ within an incubation chamber mounted on one of the LMF inverted microscopes. Lower magnification objectives (10x, 20x) are designed to be used dry without oil or water immersion fluids. Nevertheless, the 20x objective may only have a working distance of 0,5 mm. It is possible, therefore to transfer oil onto its front lens, if you swing it into place whilst examining a slide with oil on it. 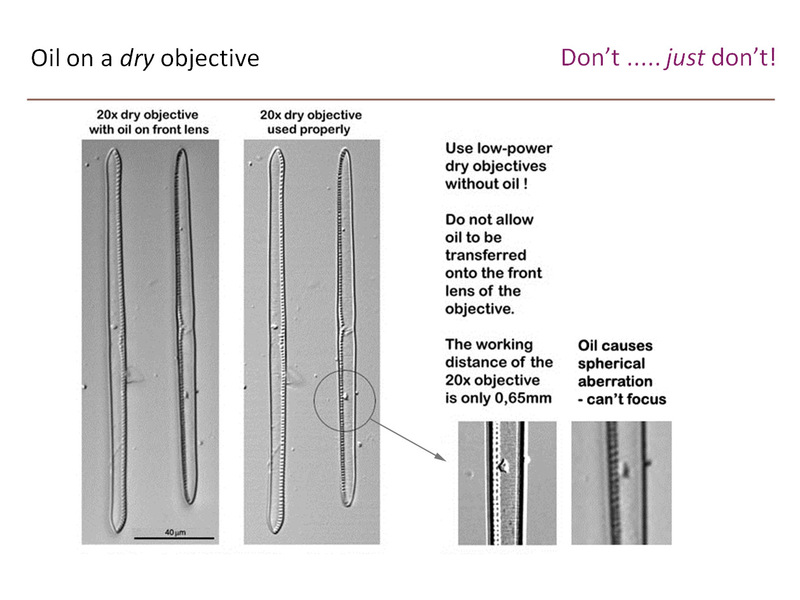 You will not be able to focus properly on your sample if you use a dry objective which has got oil on its front lens. Dry objectives have concave hemispherical front lenses. They are not flat like oil-immersion objectives, and so are much more difficult to clean when oil does inadvertently get in contact with them. 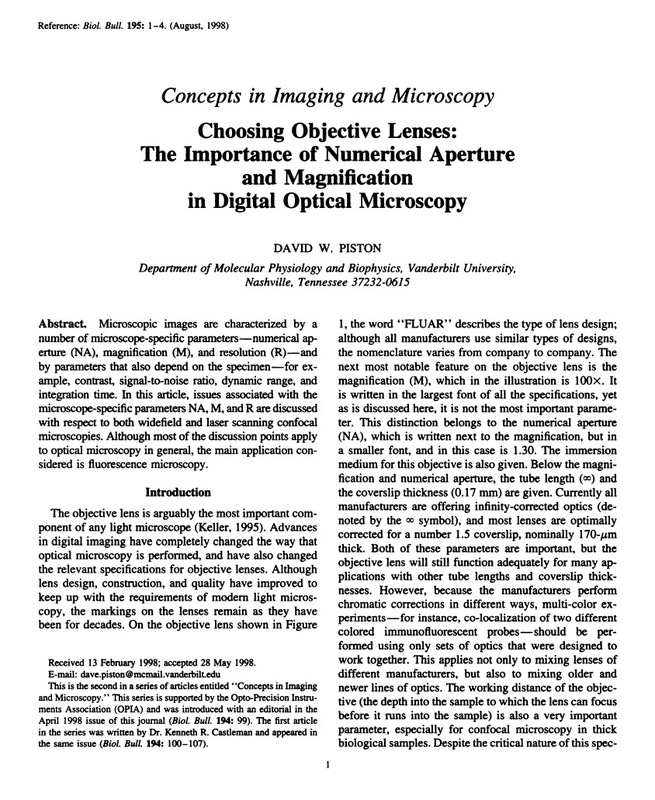 Further information can be found in Appendix 4 of Understanding Light Microscopy. 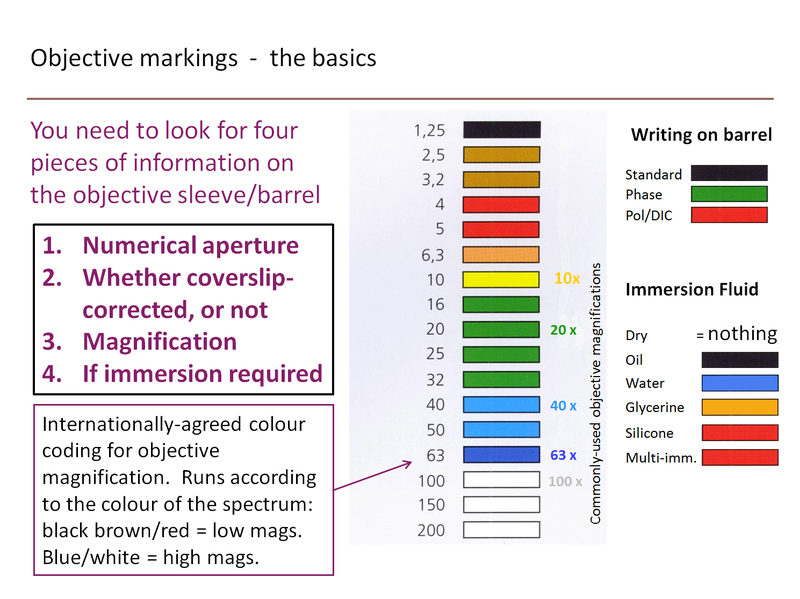 This page shows how to read the different inscriptions found on the barrel of an objective.